2016 marked a major milestone for Kirkwood. We celebrated our 50th anniversary. From cornfield to college, our dedication to the students, businesses and communities we serve is unwavering. 200,000 Kirkwood alums whose futures started within these walls. 27 buildings = 1.65 million square feet of interior learning space. Over 120 degrees, diplomas and certificates offered. More than $3 million available to all Kirkwood students. Scholarships range from $150 to full tuition. Awards based on academic achievement, financial need, areas of interest, demographics, programs of study and more! 19,902 attended class in 2015-16. 21 students - the average class size. 330 international students from 100 different countries. Percent of graduates surveyed who were satisfied with their Kirkwood education. Percent of students who believed their time at Kirkwood prepared them well for their careers. Percent who live or work in Iowa. *Information compiled through a recent study of Kirkwood graduates. The amount Kirkwood brings annually to the seven-county economy. Annual amount students' incomes rise for every credit hour completed at Kirkwood. For every dollar students invest at Kirkwood, they may see a cumulative $6.50 in higher future income. The Hotel at Kirkwood Center, the nation's only luxury teaching hotel at a two-year college. A state-of-the-art wind turbine that is used as a live training center for our Energy Production and Distribution program. EagleTech, Kirkwood's Apple-authorized Campus Store, is one of only three such stores in the state. The most credit programs in the state, ranging from Accounting to Welding. The Katz Family Healthcare Simulation Center, one of the first health care simulation centers in Iowa. The only Dental Technology program in the Midwest. 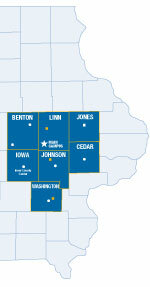 Our cadaver lab is one of a select few in Iowa. KCCK, eastern Iowa's only jazz radio station. The Iowa Equestrian Center, the Midwest's premier equestrian facility. Degree programs you can complete without coming to main campus. Online and distance learning options, including programs available entirely over the Internet. Adult accelerated learning classes help working adults balance family, career and education. 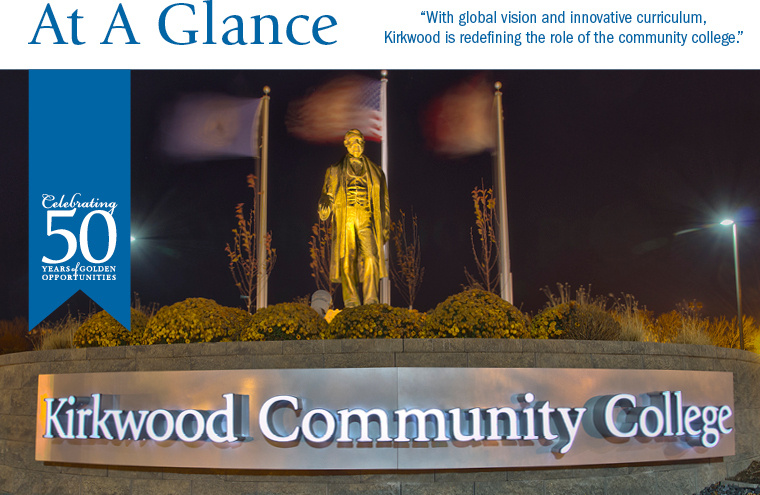 Kirkwood Continuing Education notes more than 67,000 annual enrollments in classes ranging from industry certification to career development to personal enrichment. Kirkwood Training and Outreach Services help area businesses expand and train new employees. 450 employers collaborated with annually. 13,000 workers received professional development last year. 20,000 new jobs created over 25 years. The Kirkwood Culinary Kitchen at NewBo City Market is a unique venue for year-round culinary and nutrition classes at the city's newest public market. Of the 1,200 community colleges nationwide, only 18 sit on the League for Innovation board of directors. And just one is in Iowa: Kirkwood. In 2015, Kirkwood was one of nine community colleges in the country to be honored by the US Department of Education as a Green Ribbon School for our commitment to environmental preservation. Kirkwood's ground breaking partnership with the University of Iowa, one of the leading medical research universities in the country, created the Kirkwood Regional Center at the University of Iowa, located at the University of Iowa's Research Park. State-of-the-art health care simulation center, innovative new regional centers and visionary new labs. Kirkwood is a college on the move, growing each day.